Faculty and Grad Workers picket together as our unions negotiate for fair contracts. Photography by Soohyun Kim. 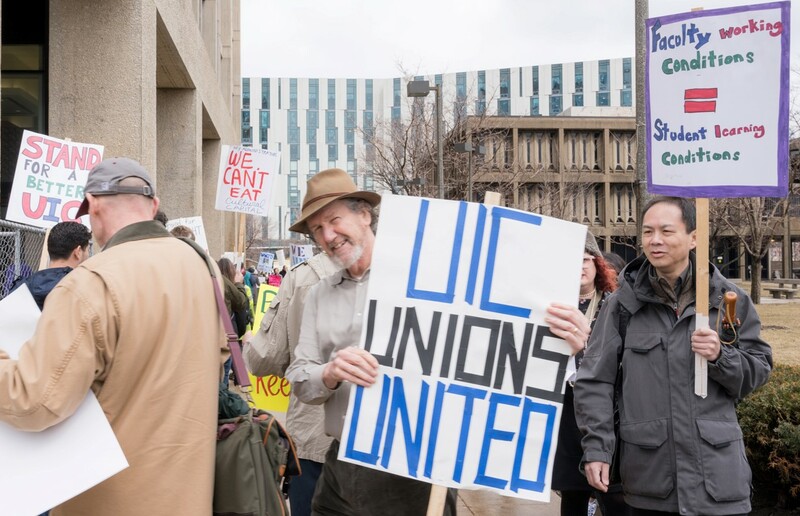 UICUF and Administration negotiators met with a federal mediator for the first time this Tuesday, marking a new phase in faculty contract negotiations. Mediation is typically sought as a way to continue making progress when negotiations become more difficult or contentious. The mediator’s role is to act as a neutral third party, while helping to broker an agreement both sides can live with. Admin acknowledged our movement largely without comment, and did not offer any other movement of their own in this session, leaving the ball in their court on all outstanding proposals. As such, no new articles where TA’d, and despite narrowing gaps in several areas, our key positions remain far apart, especially on compensation. In addition to fair raise pools, faculty are seeking protections for health/retirement benefits, a commitment to hire new tenure-line faculty, and clear procedures for discipline, dismissal and addressing academic freedom violations. Our grad worker colleagues remain on strike as Administration refuses to discuss limits on student fees or other money issues. Grads have garnered a major influx of support, both internally from departmental faculty and student resolutions, and externally from national groups and Bernie Sanders. Faculty can refer to our Faculty FAQs for information about rights and responsibilities during the strike. UICUF members are encouraged to join the GEO rally at 12pm Monday, 4/1 in the East Campus Quad to show our solidarity. UICUF organizers and volunteers, meanwhile, are continuing to have one-on-one conversations with colleagues about the potential for our own strike authorization vote. Though negotiations are still fluid at this time, the distance between the two sides, particularly on pay and equity issues, remains large. From the hundreds of conversations we’ve had with faculty thus far, there is a growing concern that a fair contract won’t be reached without putting the possibility of a strike on the table. As we discussed last week, a strike authorization vote is the first step toward being able to strike, but does not guarantee a strike will happen. Once a strike has been authorized through a vote by the membership, it is up to the bargaining team to decide whether to call it based on what is happening at the table. Authorizing a strike is one of the strongest tools union members have to exert pressure on management at the bargaining table, and it is crucial for every member to vote so that the results are an accurate representation of what the full membership wants. Members and non-members who want to weigh in or learn more, are encouraged to reach out to your College Rep or our Executive Board.